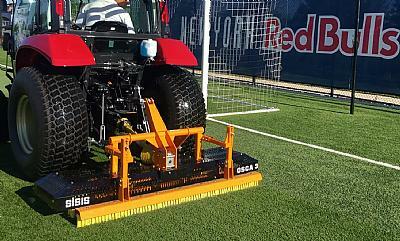 The SISIS Osca 3 is a tractor mounted oscillating brush that is equally effective on natural and synthetic turf. This means it is ideally suited for a range of requirements from artificial pitches to sports fields, cricket grounds, golf courses as well as amenity and ornamental lawn care. 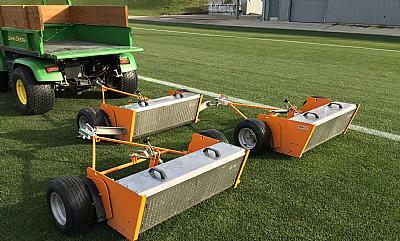 The versatility of Sisis tractor-mounted brushes Flexibrush and Varibrush means they are an ideal tool for artificial and synthetic turf maintenance. 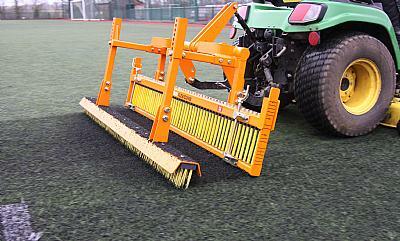 Combination brush systems which are ideal for regular maintenance of synthetic surfaces. 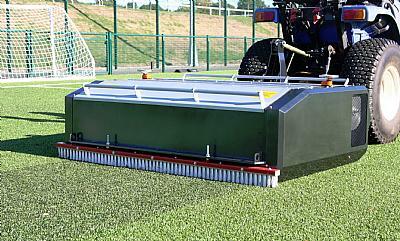 The flexicomb and straight finishing brush combination is recommended for both sand and rubber infill. The flexicomb ensures even distribution of infill and lifts the pile whilst the straight brush produces a smooth level and eye catching presentation. For rubber crumb surfaces a more aggressive brushing is required and this can be achieved by adjusting the crossbar on the flexicomb to stiffen the bristles. Designed specifically for regular routine brushing, the towed brush combinations can be used by almost any small ride-on power unit including compact garden tractors. Regular brushing should ideally take place following every 8-10 hours of play. 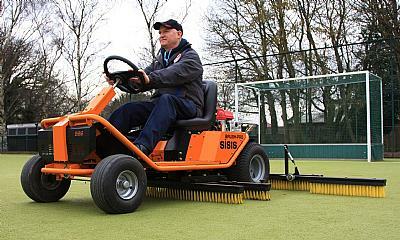 The SISIS ride-on brush system Brush-Pro comprises mid-mounted oscillating brush units and rear-mounted brushes which are ideal for artificial and synthetic turf maintenance. 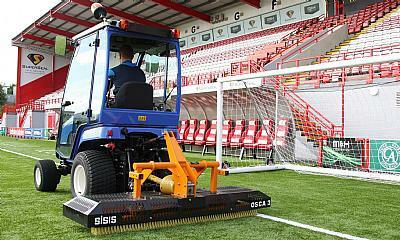 Tractor mounted rake and brush combination for decompacting either sand or rubber infill surfaces. Using either the fine grooming rake or the flexicomb with a straight brush will loosen the infill mix ensuring true and level playing characteristics, reduce the risk of injury, help maintain the surface lifespan and prevent standing water. Proven combinations designed for most small ride-on power units including compact garden tractors. Used singly or with a straight “finishing” brush, either the fine grooming rake or flexicomb are ideal for decompaction maintenance on sand or rubber infill surfaces. 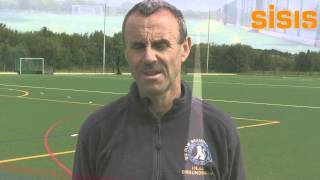 This process keeps the fibres upright allowing them to wear correctly and players to gain traction. Two versions are available, manual lift or electric lift. 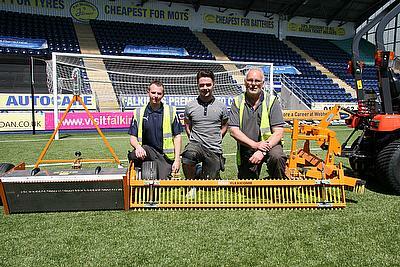 An important part of any synthetic turf maintenance programme is the collection of debris from the surface. The 450 and MK5 are pedestrian powered sweepers with contra rotating brushes that sweep the debris into a collection box to reduce the risk of surface contamination and harmful debris on the playing surface. Ideal for smaller synthetic installations such as tennis courts or golf greens. 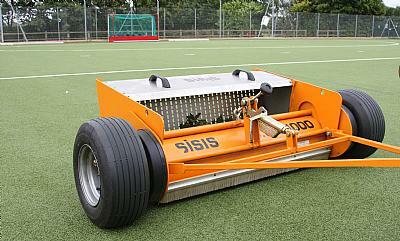 The SISIS Litamina 1200 and SSS1000 are the ideal sweepers for artificial and synthetic turf. 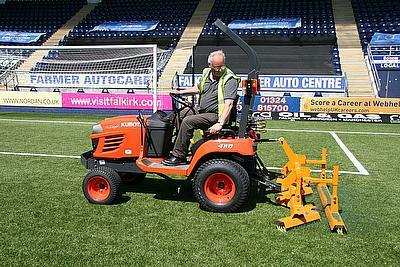 The Litamina is a compact sweeper/collector which ensures your sports pitch is ready for play while the SSS1000 is a rotary brush for use on artificial turf surfaces to remove debris. Whether it is across the whole of the surface or localized areas, infill levels can be reduced to a level where a top up of sand or rubber crumb is required. The Powaspred is a tractor mounted dresser capable of spreading either infill at the desired rate with an even consistent spread. 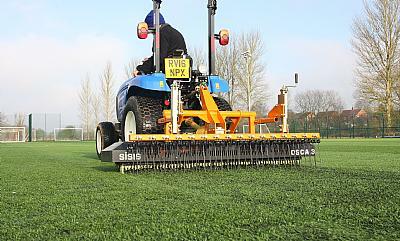 The wide range of Sisis hand operated tools will enable you to effectively maintain your artificial or synthetic pitch, with our range of brushes which are ideal for keeping playing surfaces ready for action at all times.